When you drive for Indian Trails, you’ll find a company that cares about its clients, but also about its employees. We offer competitive pay and benefits like insurance, paid holidays, vacation, and a 401(k) plan. But for many of our drivers, it’s the variety of services that makes the job great. We know bus drivers are looking for something more varied than a 9 a.m. to 5 p.m. desk job, and we think our diverse services make the job more interesting and more fun. Read more about all of the great benefits our bus drivers receive. Charters and tours – Indian Trails stands ready to book charters and tours to destinations as close as Grand Rapids and Detroit and as far as Seattle, El Paso, and Washington D.C. Needless to say, these kinds of trips can offer our drivers the chance to see the entire state of Michigan, not to mention the nation. And we take care of our drivers while they are on the road taking care of our clients. On all multi-day trips, the company pays for drivers to stay at first-rate hotels and provides a generous meal stipend. Drivers are paid at the same rate as one-day trips, with each full day being guaranteed a minimum of eight hours pay. Convention services – Indian Trails is a favorite of convention planners because we can handle any size crowd, take people anywhere they need to go, and accommodate special requests and needs with a smile. Whether it’s to and from the airport, to an off-site convention venue, or a special leadership event, Indian Trails has been there and done that well. We take pride in making each client’s event a seamless success and reap the benefits of return business for doing so. If you genuinely love helping other people have a great time, this is a great job for you. Drivers are paid the straight hourly rate for the hours they work, and the company pays for hotel and food if overnight stays are required. Shuttles – If you enjoy meeting a variety of people during your work day, shuttle driving is right up your alley. Indian Trails provides this short- and medium-distance, back-and-forth service for many different purposes from conventions and tradeshows, to shopping malls and concerts, or regularly scheduled shuttles like our partnership with Wal-Mart to transport residents of senior complexes to stores. In addition, Indian Trails operates the Bronco Transit at Western Michigan University in Kalamazoo that shuttles students around campus, and a similar program at Michigan State University in East Lansing driving students in outlying apartment complexes to and from campus. Drivers are paid the straight hourly rate for the hours they work. Airport service – One of Indian Trails’ most loved services is the Michigan Flyer that transports people from East Lansing and Ann Arbor to both terminals at Detroit Metropolitan Airport. What began as a really convenient way to get to the airport has become a Michigan transportation institution that has achieved an amazing ranking of 98 percent for reliability. “The Flyer,” as it’s known, has a schedule that is designed to meet the needs of its riders with a Sunday through Friday schedule, a Saturday-only schedule, and a holiday schedule. Operating 365 days a year, the Michigan Flyer has served people from all over the world without ever leaving Michigan. Drivers are paid the straight hourly rate for the hours they work. 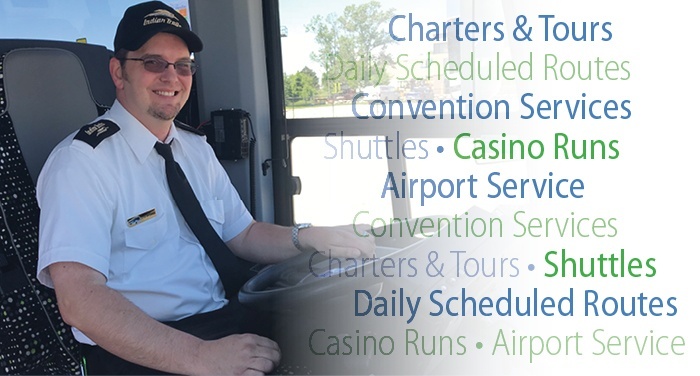 Casino runs – Another unique service Indian Trails offers is our casino shuttles to Greektown Casino in Detroit and Firekeepers Casino in Battle Creek. These are regularly scheduled trips that pick up Greektown patrons at 12 different stops across metropolitan Detroit on Tuesdays and Wednesdays and Firekeepers patrons at stops in Owosso and East Lansing on Tuesday mornings. These trips require reservations and can be a lot of fun, especially if you happen to have winning riders! Of course, if a group wants to charter a casino-bound motorcoach, Indian Trails travels to all the casinos in Michigan and many other states, as well as the Province of Ontario. Drivers are paid the straight hourly rate for the hours they work. Daily scheduled routes – Indian Trails also has daily routes throughout Michigan’s Upper and Lower Peninsulas, and to cities in Indiana, Illinois, Wisconsin and Minnesota. These regular city-to-city routes include destinations like Detroit, Grand Rapids, Kalamazoo, Traverse City, Flint, Saginaw, Tawas City, and Alpena, as well as Chicago, Milwaukee, Escanaba, Marquette, Ishpeming, Iron River, Ashland and Duluth, to name a few! If you love the Great Lakes, you’ll love driving these routes, many of which hug the shoreline or end up in a waterfront city. Pay for route drivers is at a straight hourly rate. When the route requires an overnight stay, the company pays for a first-rate hotel and provides a generous meal stipend. If you like variety, love people, and long for the open road, Indian Trails has opportunities for you. Download our guide, “Explore Charter Bus Driver Jobs” and find out more about driving jobs at Indian Trails today!